No matter where you’re at in your career effective time-management strategies leads to success. Whether you’re a seasoned professional or it’s your first day on the job, effective time-management strategies are critical to achieving success. Tanya Wheeless’ years of first-hand leadership experience from her time as a senior vice president with the Phoenix Suns, to serving as CEO of the Arizona Bankers’ Association to running her own executive coaching business, have shown her the struggles people face at all professional levels in all roles. 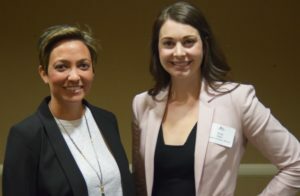 During April’s Professional Women’s Alliance Luncheon, Wheeless, founder of wellness company Happy Grace, provided professionals with tips and a deeper understanding of what it takes to manage time efficiently. Wheeless identified value alignment and fear as the two main reasons why some tasks get pushed back perpetually, which impedes success and growth. Wheeless encourages professionals to determine the reason why a particular task seems daunting and is stuck at the bottom of a to-do list. “This is what will create long-term positive change in the way you manage your time,” Wheeless said. After understanding the challenges to efficiency, Wheeless provided strategies to help professionals overcome time-management obstacles. Just like in the world of investing and 401ks, professionals should aim to pay themselves with their time first. Wheeless encourages people to set their personal priorities and schedule them before anything else. When the goal is to complete the task at hand, remove everything informing you that someone is trying to take your time. Turn off the phone, Facebook notifications and even close the door if necessary. All time and all tasks are not created equal. Not everyone fits into the same mold. Identify your most productive hours and schedule that time to do your most challenging work, leaving easier tasks to the times when your energy is lower and you’re not as sharp. Set yourself up to conclude each day on a good note by taking your master to-do list and narrowing it down to the real priorities for that day. This exercise helps professionals transition from being overwhelmed to being focused on accomplishing the most important tasks. The next Professional Women’s Alliance luncheon will be on Tuesday, May 3, featuring Gay Meyer, assistant vice president of HR region operations for USAA. Meyer will discuss overcoming “imposter syndrome” a phenomenon affecting high-achieving women who feel they are not deserving of their hard-earned successes. Register today!